These are all the things that’ll help you create a nice balance between the standard and vertical navigation on your website. By making the standard and vertical navigation overlap, your website won’t feel like it’s being dominated by the vertical navigation. The main content on your website will adjust itself to the vertical navigation but the secondary menu and footer will behave in the same way it behaves when vertical navigation isn’t enabled. In a previous post, we’ve shared some examples of websites that use the vertical navigation. All of the examples showed us how creative you can get with a Divi option that is not that often used. A thought-through vertical navigation on your website can give that extra interaction you were trying to achieve with your visitors. While showing the examples, there were some comments that inspired us to show you how to achieve certain results. This post is one of those inspiration-based tutorials that will show you how to make some tweaks to your website without having to search for solutions yourself. We’ve been inspired by the Alex Brands website that uses the secondary menu at the top and the vertical navigation on the left side of the page. While scrolling, the secondary menu scrolls along. It gives that nice extra little touch to the website and it helps to keep the focus on the content within the secondary menu. Alex Brands is an e-commerce website and the fixed secondary menu helps to remind people what’s in their shopping basket and the deal that they’re offering. This kind of vertical navigation is especially interesting for e-commerce websites. The vertical navigation makes it easy for visitors to navigate through the different categories of items that are offered on the website. It’s easier to follow the menu items when they’re located in a vertical navigation since it’s easier interpreted as a list people have to go through. Before we dive into the part where we show you how to make your standard navigation overlap your vertical navigation, we’re going to go through the general steps first. These general steps are the foundation you’ll need to go through before you apply the overlap. Without any further due; let’s get started. The first thing you’ll need to do (if you haven’t done that already) is add a menu and the menu items to your website. These are the menu items that will appear within your vertical navigation. To add a new menu to your website, go to your WordPress Dashboard > Appearance > Menus. 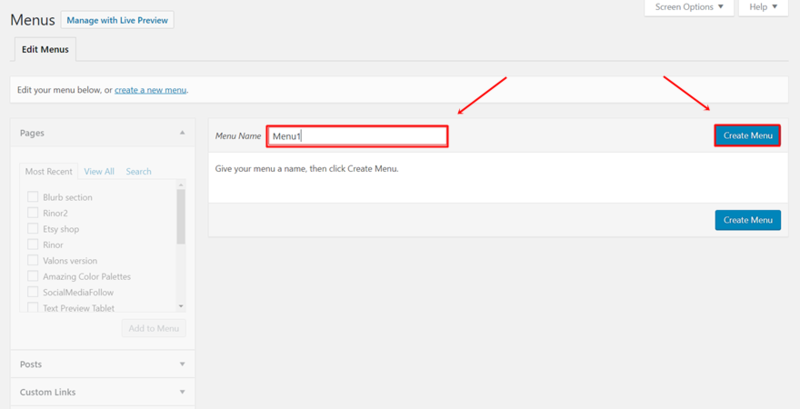 Once you’re on that page, give your new menu a title and create the menu. Continue by adding menu items and making this your primary menu. The next thing you’ll need to do is activate your secondary menu. To make sure the secondary menu appears on your website, your secondary menu must have an element that is activated. In this post, we’ll only add the social media icons, but you can, of course, add whatever you like. 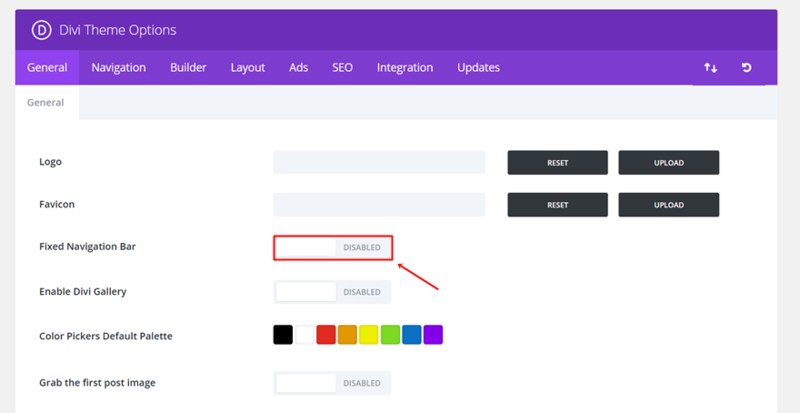 To activate the secondary menu and make the social icons show up, start by going to your WordPress Dashboard > Customize > Header & Navigation >Header Elements > Enable the ‘Show Social Icons’ option. The next step you’ll need to take is enabling the vertical navigation within your Divi builder. To do that, go to your WordPress Dashboard > Appearance > Customize > Header & Navigation > Header Format > Enable the vertical navigation. Besides that, you can also choose where you want your vertical navigation to appear; on the left or right side of your website. Before we go over to the advanced modifications, there’s one last thing left to do: disabling the fixed navigation for your primary menu. If you’ve already disabled primary menu, skip this step. 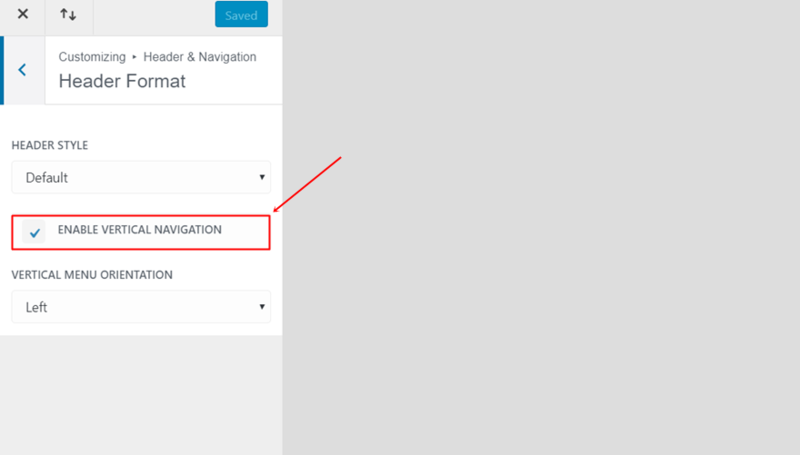 If, however, your primary menu is currently fixed, go to your WordPress Dashboard > Divi > Theme Options > And disable the fixed navigation. In the next part of this post, we’re going to show you how to make your standard and vertical navigation into something different than usual. When it comes to vertical navigation, we’re used to seeing a part of the screen being covered up by it. The secondary menu and the footer will, by default, not pass the vertical navigation. But in some cases, we want to make sure the secondary navigation and footer are on top of the vertical navigation. That way, the only thing that’ll depend on the vertical navigation is the main content. Your website won’t feel like it’s completely divided in two places; the vertical navigation and the rest of the website. In this post, we’ve shown you how to combine standard and vertical navigation on your website. More precisely; we’ve shown you how to make the secondary menu and footer overlap your vertical navigation and how to make your secondary menu fixed. If you have any questions or suggestions; feel free to leave a comment in the comment section below! Thank you so much Donjete for this tutorial! I’ll come back here when I get my first vertical navigation project!! i can’t see the images associated with this post?? Thank you, interesting article. Is it possible to show left sidebar when I scroll the page? If it is which code I have to use? Thank you for the tut, I found it helpful 🙂 There’s a number of grammatical and spelling errors. For example, the proper phrase is “without further ado”. Keep up the good work! Thanks for this! Been trying to make a vertical nav work for a while now. The one thing is that now my headers on each page aren’t showing correctly. I’ll try to tweak it. This works mostly but it blocks the 2nd level of nav from showing on the screen. I have the left nav (example: about us) and under it are “contact us” and other pages. That navigation disappears when I use this css. Very nice tutorial Donjete Vuniqi! Could you please tell me how do i make both Vertical Navigation (primary menu) and Secondary Menu (on top) remain fixed? I love using divi. it has lots of functionality. Now one more added. Thanks. Keep doing good work and keep updating. I’ve tried pasting the css you include above but STILL my menu is sticky. I want it to scroll up and disappear when I scroll down my page. Please do You have solution for hiding vertical menu ( vertical navigation ) only when standing still and show up when scrolling, not to hide entirely but only when cursor standing still.